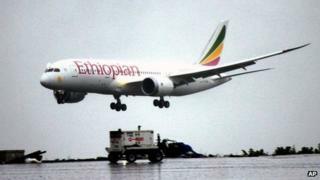 Ethiopia has become the second country after Japan to take delivery of the Boeing 787 Dreamliner. Ethiopian Airlines has bought 10 of Boeing's flagship aircraft, which are built from lightweight material, rather than aluminium, to save fuel. The BBC's Catherine Byaruhanga in Addis Ababa says that despite the pouring rain, a marching band gave a fitting welcome as the first plane arrived. Ethiopian Airlines is one of Africa's biggest airlines. Our reporter says when the first Dreamliner arrived, it was a very proud moment for the company's workers and many took photographs of the new plane. "As a continent this shows how much we are making progress as Africans... competing on the global stage and changing our image," Ethiopian Airline head Tewolde Gebremariam told reporters at Addis Ababa's Bole International Airport. The aircraft are supposed to cost $200m each but correspondents say airlines rarely pay this price, especially for bulk orders. Japan Airlines and All Nippon Airways are the only two airlines already operating Dreamliner aircraft. Ethiopian Airlines generally has a good safety record, apart from the 2010 crash of one of its aircraft off the coast of Lebanon. The state-owned company serves 69 international destinations.